Piibutopsu holiday home has four rooms with all modern comforts which are ideal for family holidays. In all rooms there is kitchen fully equipped with all necessary modern appliances, and toilet/wet room. Please read more about the Terms and Conditions of your stay, bookings and payments in the following link: link. The room with the view over the front garden and due to its size would be perfect for a family. The kitchen is equipped with dishwasher, microwave oven, stove, fridge and all necessary items of kitchenware for cooking. There are 4 single beds. The room with a beautiful view over the meadow where the roe deer like to walk past in the morning hours. 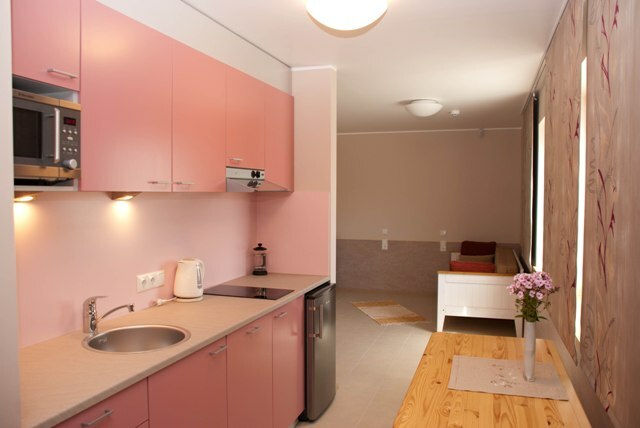 The kitchen is equipped with microwave oven, stove, fridge and all necessary items of kitchenware for cooking. This room accommodates 2 people. The room with a little lounge area where you can enjoy a beautiful view of sky full of stars in the dark August night. The kitchen is equipped with dishwasher, microwave oven, stove, fridge and all necessary items of kitchenware for cooking. This room accommodates max. 5 people and extra bed can be requested. In the morning you will be woken by the birch tree whispering in the wind. The kitchen is equipped with microwave oven, stove, fridge and all necessary items of kitchenware for cooking. This room accommodates 2 people.